Since ancient times, healing touch has been used in all cultures. Civilizations in the East and West found that massage could heal injuries, relieve pain, reduce stress and promote a deep sense of relaxation. 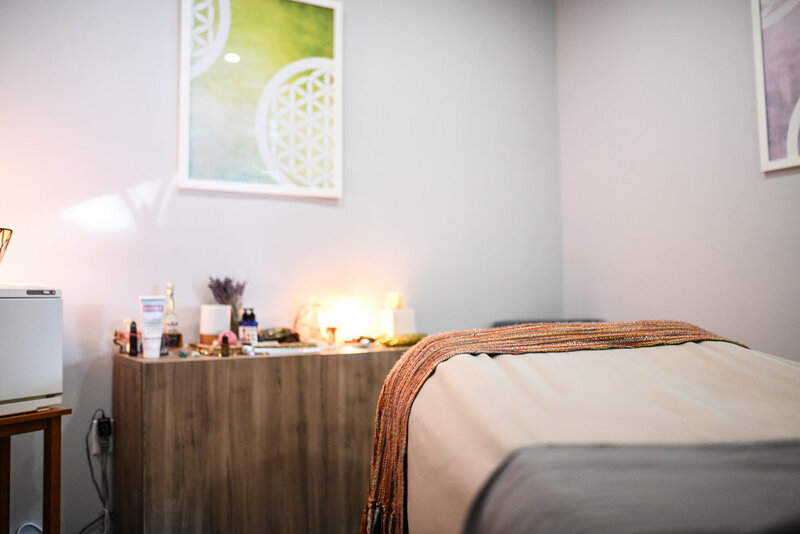 Our experienced massage therapists are well trained in many different styles of massage therapy including relaxation, sports, prenatal, hot stone, aromatherapy, deep tissue, and cupping massage. Massage therapy has many tangible, long lasting benefits—in addition to feeling blissful afterward. We all know that it can smooth out our tight, painful muscles but it can also help to decrease insomnia, anxiety and depression, and combat postural stress from sitting all day at a desk job or speed recovery from vigorous exercise. The most important thing you can do before arriving for your massage appointment is to relax. We recommend arriving 15 minutes early to let go of the stress of the day. Be sure to drink plenty of water and avoid eating a heavy meal for 2-3 hours before your appointment. What makes my massage unique? My technique utilizes long flowing strokes with medium to deep pressure, allowing me to feel resistance in muscle tissue and slowly release the tension. This helps bring the client to a deeper relaxed state that can help reduce the intensity of deep tissue work. I also practice craniosacral therapy which interacts with the central nervous system to help release tightness in the neck which can lead to headache. Symptoms related to nerve compression, likely caused by compression of the surrounding musculature. Headaches or migraines. I incorporate Reiki into my techniques which allows the body to relax and self-correct. It naturally relieves pain and dysfunction. What keeps me passionate about massage therapy? I like to help people. Knowing that I was able to make someone’s day by relieving him or her of pain makes me happy. I connect with people, I’m a feeler. I have been practicing in the Seacoast for over five years, primarily based in a hospital settling which allowed me to work on many sensitive cases, ranging from joint replacements to oncology. I want to establish a trusting relationship with my clients. I truly care about why they are here and what their needs are. Listening is where it starts, I want to provide a safe space for my clients as we custom-tailor each session to target their goals using a variety of modalities. Someone that is wellness minded who values their health. I want to be a part of aiding you to your optimal health. Massage is both an art and a science. I am an artist by trade. School was never my thing until I studied to be a skin therapist which lead me to massage. I geeked out on continuing education. A big part of continuing education is experiencing these modalities yourself, it helps you understand the different avenues in the wellness industry. I love that our field falls under such a large umbrella—there are so many modalities that you can add to your personal tool box which I look forward to sharing with my clients. Utilizing myofascial, deep tissue and Swedish massage, I blend these techniques to treat many different individuals and conditions including, but not limited to: infants, adolescents, adults, the elderly, pregnant women, pre and post-operative patients, cancer patients, musculoskeletal injuries, acute and chronic pain, as well as many others. Massage and/or therapeutic touch can always be adjusted to meet your specific condition(s) and needs. A client who is seeking to enhance and improve their health, and attain and maintain wellness. I enjoy working with individuals who want to build a therapeutic relationship where needs and goals are identified and strived for. What I love most about massage therapy is facilitating the process of an individual's path to health and healing. My unique approach to massage therapy addresses clients needs through a methodical, intuitive technique that will relieve stress and tension in a relaxed nurturing environment. My ideal client is an individual who may be suffering from acute or chronic pain in their body. Someone who is open to healing with different styles of massage modalities. Someone with the openness to take advice and action on self-care practices at home to maintain their body in between bodywork treatments. Every body is different, which keeps my day to day ever changing. Many people suffer from chronic pain and it’s always an exciting challenge to work with different ailments each day. It’s most rewarding to work with a client over time and see life changing improvements.